SPACEPORT NEWSPage 3 October 15, 1999 On Sept. 28, members of the 1998 astronaut candidate class (group 17) toured Kennedy Space Center, including Orbiter Processing Facility Bay 3, where they got a close-up look at the tiles under the orbiter Atlantis (above). They also toured the Space Shuttle Main Engine Processing Facility (below), the Vehicle Assembly Building, the Space Station Processing Facility, the launch pads, the Shuttle Landing Facility, the Apollo/Saturn V Center and crew headquarters. The class came to Kennedy Space Center for training activities, including fire training and a flight awareness program. U.S. candidates include Clayton Anderson, Lee Archambault, Tracy Caldwell, Gregory Chamitoff, Timothy Creamer, Christopher Ferguson, Michael Foreman, Michael Fossum, Kenneth Ham, Patricia Hilliard, Gregory Johnson, Gregory Johnson, Stanley Love, Leland Melvin, Barbara Morgan, William Oefelein, John Olivas, Nicholas Patrick, Alan Poindexter, Garrett Reisman, Steven Swanson, Douglas Wheelock, Sunita Williams, Neil Woodward III and George Zamka. International candidates are Leopold Eyharts, Paolo Nespoli, Hans Schlegel, Roberto Vittori, Bjarni Tryggvason and Marcos Pontes.Astronaut candidates at KSCMired in wire: workers perform intricate inspections An electrical short during liftoff of Space Shuttle Columbia in July was traced to a wire in the payload bay with damaged insulation. As a result of that problem, NASA decided to inspect the wiring in all four Space Shuttles and make repairs as required. At left, technicians examined, repaired and protected the wires onboard orbiter Discovery on Sept. 23. Discovery is being readied to fly the next Shuttle mission (STS-103), which will be the third Hubble Space Telescope servicing mission, now targeted for Dec. 2. Above, a technician examines the wires onboard the orbiter Endeavour on Sept. 23. Endeavour is slated to fly the following mission, STS-99. That will be the Shuttle Radar Topography Mission, scheduled to launch Jan. 13, 2000.Hispanics: Looking Forward to the 21st CenturyKSC Director Roy Bridges (left) and the chief of KSCs Equal Opportunity Program Office, Ken Aguilar, enjoyed the artwork of four Hispanic artists displayed in the Galaxy Theater at KSCs Visitor Complex after the 15th annual Meet Your Directors luncheon on Oct. 8. The luncheon and the display of artwork were sponsored by the Hispanic Employment Program Working Group in celebration of Hispanic Heritage Month. Page 5 SPACEPORT NEWS October 15, 1999 Clean Cities ...(Continued from Page 1)pressive, Shriver noted, commenting on his STS-31 mission. Our orbit carried us up to the southern coastline of the U.S. and the Gulf Coast, and when we looked north several times coming through that part of the orbit, we could see well beyond the Great Lakes and into Canada from that vantage point. Shriver pointed out that an orbiters altitude and speed in space offer other interesting observations. When traveling roughly 18,000 miles an hour, you go around the Earth completely once every 90 minutes, he said. This produces a new perspective on the size of the Earth; it effectively shrinks the size of the Earth, and you begin to get the sense that this is a little more fragile place than were all accustomed to thinking about. His comments punctuated the central point of the ceremony promoting local government and industry partnerships to encourage and expand the use of alternative fuels. These partnerships should provide an expanding network to improve and maintain good air quality while conserving energy resources. The ceremony was also the kickoff for the Federal Alternative Fuel Vehicle USER Program. This program is an interagency task force led by the U.S. Department of Energy and the General Services Administration (GSA) to increase the number of alternative fuel vehicles in federal fleets andAt left, STS-31 Commander Loren Shriver, holding a HASSELBLAD camera, looks away from his Earth observation work on the aft flight deck of Discovery to smile for a fellow crewmember's snap shot. Above, this high oblique view of Madagascar, taken during that mission, shows that the majority of this Texas-sized island is now largely deforested and is suffering from severe soil erosion. That has led as well to declining biological species diversity. At the turn of the century, the island was almost totally forested, but now, forests cover only about 10 percent of the surface. Evidence of soil erosion can be seen in the offshore sediment plumes. Below, The Florida Space Coast Clean Cities Coalition logo represents nine Florida counties committed to using alternative fuel vehicles to curb air pollution from auto emissions and to helping to promote energy independence from foreign oil. More information about the coalition can be found at http://www.fsec.ucf.edu/env/fsccities.htm.thereby substantially increase the use of alternative fuels. The area of Melbourne/Titusville/Kennedy Space Center was designated as one of six regions across the country in which the number of alternative fuel vehicles would be increased. Indeed, Kennedy Space Center was recognized during the ceremony as one of the coalitions leading examples of expanding the use of alternative fuel vehicles and developing refueling capability. KSCs alternative fuel vehicle leadership within NASA supports NASAs top 10 position in the number of alternative fuel vehicles in federal agency fleets, Shriver pointed out, and were very proud of that fact. H.T. Everett, chief, liquid propellants and fluids management, Logistics Directorate, pointed out that partnerships among NASA, the Department of Energy, the General Services Administration and industry resulted in KSCs state-ofthe-art refueling facility and the deployment of 165 alternative fuel vehicles in KSCs fleet, which is the largest of any NASA location. Shriver noted that the designation of the Space Coast and central Florida area as the 75th Clean City dove-tails nicely with NASAs goals of education and technology advances without negative impact to the environment. As we strive to make this area of Florida the number one launch choice in the world, he said, we also realize the men and women who do that work want to live in a nice, healthy environment. One of the space centers four guiding principles is environmental stewardship particularly critical since KSC is located on the Merritt Island National Wildlife Refuge. Transitioning KSCs ground tranportation vehicles to AFVs supports KSCs guiding principle, Shriver stated, and contributes to our nations energy independence. Shriver included in his remarks some personal observations he made during his three missions in space. In the midst of all this great scenery thats out there, Shriver pointed out, is also great evidence that human beings have been waging war on the environment in several areas of the world, and the results are not good. The island of Madagascar off the east coast of Africa once was a really lush tropical island covered by forest, he said, and in a matter of probably 20 to 30 years, just about everything on that island except whats up at the top of the high mountains on the eastern backbone of the island was cleared away. When you fly over it at the altitude that we were, you can see the entire island. And all the rivers that drain down from the mountains are just clogged with erosion... We have to remember to take care of the environment. John F. Kennedy Space Center Managing editor. . . . . . . . . . . . . . . . . Bruce Buckingham Editor. . . . . . . . . . . . . . . . . . . . . . . Susan Maurer Editorial support provided by Information Dynamics Inc. Writers Group. NASA at KSC is on the Internet at http://www.ksc.nasa.gov USGPO: 533-128/00017Spaceport News Spaceport News is an official publication of the Kennedy Space Center and is published on alternate Fridays by the Public Affairs Office in the interest of KSC civil service and contractor employees. Contributions are welcome and should be submitted two weeks before publication to the Media Services Branch, AB-F1. E-mail submissions can be sent to Susan.Maurer-1@ksc.nasa.gov SPACEPORT NEWSOctober 15, 1999 Page 6 The International Space Station starboard truss, which will become the backbone of the orbiting International Space Station (ISS), arrived on Oct. 6 at KSCs Shuttle Landing Facility aboard the Super Guppy transport aircraft. It was flown from a division of the Boeing Company in Huntsville, Ala. This truss segment, designated S1, is a 45-by-15 foot aluminum structure weighing 30,800 pounds when fully outfitted and ready for launch. The primary function of S1 is to provide heat transport and heat rejection capability required for the International Space Station and to provide structural integrity for the outboard truss segments. Scheduled for launch in the summer of 2001, astronauts will attach the S1 truss in space to the previously launched S0 truss.International Space Station starboard truss segment at KSC During processing at KSC, the S1 truss will be outfitted with the thermal control radiators, the Crew and Equipment Translation Aid (CETA) cart, S-band communication equipment and external video equipment. Additional items to be integrated at KSC include the command and data handling processors (C&DH), the Direct Current (DC) conversion units, and the Secondary Power Distribution Assemblies (SPDA). Once completed, the truss will undergo functional testing of integrated electrical and dataKennedy Space Centers Combined Federal Campaign is in full swing The 1999 KSC Combined Federal Campaign (CFC) got off to a rousing start with a spirited kickoff on Oct. 1 in the Training Auditorium. The gospel group Remember Me led all in attendance in a lively rendition of the national anthem. Loren Shriver, KSCs deputy director for Launch and Payload Processing, and Barbara Brown, NASAs chief information officer at KSC, who chairs this years campaign, both challenged unit coordinators, key solicitors and the NASA at KSC workforce to rise to the occasion and once again show that we are those who care and that we share! This years guest speaker, Brenda Harris, executive director, Exchange Club Center for the Prevention of Child Abuse (also known as Yellow Umbrella), a United Way of Brevard County Member Organization, gave a stirring set of remarks that reminded KSC employees where their contributions go and just what they can do. The campaign has now reached the halfway point, and contributions are continuing to pour in. NASA employees can check the statistics for their own directorates and organizations by visiting the CFC Web site at http://cfc99.ksc. 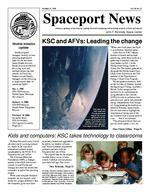 nasa.gov/ Links to the Web site can be found on the NASA KSC home page and employees internal home page. This years campaign includes weekly prize drawings from the names of all contributors. For people who have not contributed yet, but turn in their contribution forms by Oct. 20, they, along with all previous contribu-Above, Brenda Harris, executive director, Ex-change Club Center for the Prevention of Child Abuse (a.k.a. Yellow Umbrella), spoke at Kennedy Space Centers kickoff meeting for the Combined Federal Campaign on Oct. 1.tors, will be eligible for the third week drawing, the prize of which will be a $50 gift certificate for the winner to spend at the NASA Exchange. The fourth weeks drawing will award four passes for the Kennedy Space Center Visitors Complexs Bus Tour and an IMAX Movie. The drawings will culminate with a Grand Prize drawing at the conclusion of the campaign, which will award a $100 gift certificate to the NASA Exchange, plus two passes on the Center Directors bus for an upcoming Shuttle launch, as well as a photograph with the center director. The International Space Station S1 truss arrived at KSCs Shuttle Landing Facility on Oct. 6. systems, which includes MultiElement Integrated Tests. The S1 truss was transported to the Operations and Checkout Building, which has recently been reconfigured from processing Spacelab modules to processing ISS trusses.